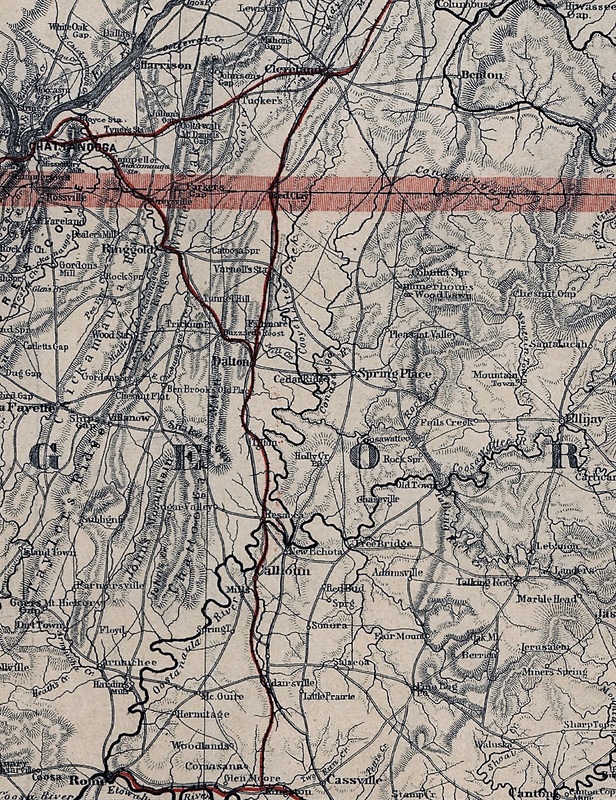 1865 Map: Mountain Region of N.C. and Tenn.
Geography and Map Division Washington, D.C.
Cohutta Springs "west," or Cohutta Springs P.O. 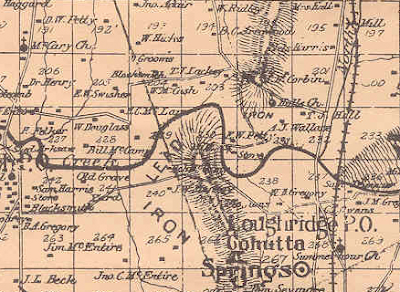 (a historic area located on modern-day Georgia Highway 225 in Murray County, Georgia) does not show on this 1865 map. Further east of there, east of modern-day US Highway 411, is Cohutta Springs Conference Center, located very near the old mineral springs and resort area, which existed before the Civil War. That location does show on the above map. (See "Cohutta Spr" above "Summerhours or Wood Lawn." Pleasant Valley, below there, is modern-day Eton, Georgia. The Cohutta Springs Post Office closed during the Civil War, and reopened again later. 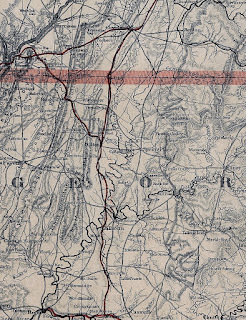 On this 1865 map, the road from Calhoun, Tennessee, to Spring Place, Georgia, shows as a slightly curved, but direct, route to Spring Place. Studying topographical maps of the closest era I could find (about 1891), it seems highly unlikely that the road would be smoothly curved, lying as it does on the west side of the Hiwassee River and passing down through the mountains. At a point on the Conasauga River, where it crosses the Tennessee State line near that old Spring Place Road, it is indeed about twelve miles east of Red Clay, where Cruft was headquartered. I have mapped a modern equivalent of the approximate route of that road, and it shows a mountainous road from the outset. Granted, not all of these modern roads would have been extant in 1864, but this gives the general idea of the route Long must have taken, judging by the 1865 map above, which was drafted between 1863 and 1864. The old route, as I mapped it, would have Long crossing the Charleston railroad bridge from Calhoun, and then travelling south on the road that shows on the 1865 map as a direct road from Calhoun, leading south/southeast to intersect Benton Pike at its halfway point; and then continuing south to the Cohutta Springs P.O. area, or Cohutta Springs "west" (not shown on the 1865 map), to a location on the Conasauga River near the Tennessee-Georgia state line, a trip (today) of about thirty miles, the historic point of reference also mentioned in Long's report of the 27th, from page 472 of Official Records. My modern-route equivlent is this: Charleston, Tennessee to Benton Pike, via Chatata Valley Road, NE (Cleveland); continuing South on Hancock Road, NE, until it intersects US Highway 74; straight across to go South on Kinser Road until it becomes New Hope Road SE; continuing South on New Hope Road SE to Ladd Springs Road SE; left (East) on Ladd Springs Road SE to Million Road; bear right at "Y" onto Million Road, down to TN State Hwy 74/Spring Place Road SE; left (East) on Spring Place Road SE/Hwy 74 and continue South until it crosses the state line into Georgia and becomes GA Highway 225; and south on GA Highway 225 to 798 Coffey Road, Crandall, Georgia. The destination of 798 Coffey Road, Crandall, Georgia, is a random point chosen to mark the locale near the Conasauga River at the Tennessee-Georgia state line. The Waterhouse plantation (also called Oakwood Plantation) is further south. It is a private residence and historic on Highway 225 at the intersection of Halls Chapel Road. However, Long camped at the Waterhouse mill, which would have been further out, on the Conasauga River. Waterhouse owned a great deal of land near Cohutta Springs "west" in northern Murray County. His nephew, Callaway Campbell, owned land in that area, as well, and extended out to the area of the river on several sides. Map, Mountain region of North Carolina and Tennessee, Nicholson, W. L., A. Lindenkohl, H. (Henry) Lindenkohl, and Charles G. Krebs, Charles, United States Coast Survey. Published [S.l. ], U.S. Coast Survey, A. D. Bache, Supt., . Call No. G3900 1865 .N5, LC no. 99447196, Library of Congress Geography and Map Division Washington, D.C. Digital ID: http://hdl.loc.gov/loc.gmd/g3900.cw0079a60 . LCCN Permalink: https://lccn.loc.gov/99447196. Correspondence: Long to Whipple, 22 Feb. 1864, Near Burnt Mill, On Cleveland and Spring Place Road,"
O.R. Series 1, Vol. 32, Pt. 1, (Reports), 469. The War of the Rebellion: v.1-53 [serial no. 1-111] Formal reports, both Union and Confederate, of the first seizures of United States property in the southern states, and of all military operations in the field, with the correspondence, orders and returns relating specially thereto. 1880-1898. 111v, Washington: U.S. Government Printing Office, 1891. (Link) Accessed 18 July 2016. REF. 3: Ibid., 472, Rept. by Eli Long, 27 Feb. 1864, [from field] near Lee's House, Ga. (Link). Halls Chapel Road runs between Georgia Highway 225 to U.S. Highway 411. At one time, the communities on both ends of that road were designated as Cohutta Springs. Cohutta Springs (west) has been described in another post. It was designated on the map as a post office. This may have been considered town center of Cohutta Springs, or it may have simply been the location of the second post office. 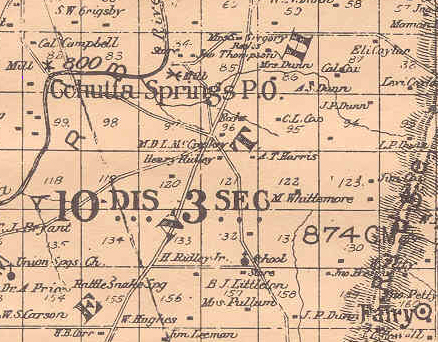 It is closer to the little town (also long gone) that grew up around the mineral springs, which is just east of this area, at the on what is now Cohutta Springs Road. On 7 May 1862, Thomas H. Calloway makes a deed to Thomas Leach, of lots 46, 47, 48, 49, 60, 61, 84, and 85 in the tenth district, third section, of Murray County. [Rf. : Deed Book L, page 104, Murray County, Georgia]. $20,000 paid to Calloway. I didn't make a note as to type of deed--it's probably a property deed, since I have no note to say otherwise. On the same date, there is a deed from Thomas Leach to Thomas H. Calloway--Trustee, of lots 46, 47, 48, 49, 60, 61, 84, and 85 (same lots, same district and section as above). Then my note says $20,000 paid to Leach, "for the sole and separate use and maintenance of Mrs. Cornelia F. Waterhouse the wife of Euclid Waterhouse during her natural life not subject to her husband's debts or liabilities of any character whatever..." At her death, it is to be settled/executed at her direction. I understand that someone can be a trustee, but am not sure why Leach would pay $20,000 to Calloway, then Calloway would pay the same amount to Leach--or did I misunderstand and extract it incorrectly? Do they just go through the legal motions so that the other person is legally responsible, to prevent malfeasance? Or maybe it means $20,000 of land from one, in receipt of which $20,000 in cash was paid to the other, for the support of Mrs. Waterhouse? I may even have a mistake in my extract. Also, the fact that this happened in 1862 made me wonder if the transaction was war related. Note: Thomas Leach is probably Dr. Leach--at least, I've concluded that he is the same as the physician who attended Jacob Headrick (Jr.) of Cohutta Springs (west 10th/3rd--Waterhouse area), after the Civil War. Cohutta Springs Maps is a sub-section of Cohutta Springs History. The Cohutta Springs place name is not as prominent as it once was. It's no longer a town. It is a thriving community, though. Businesses in the area still use the name of Cohutta Springs, though their mail delivery comes through Crandall or Chatsworth. It's interesting to look back at a little town that thrived for a time and then disappeared into the forest. At various times there were towns, resorts, popular minerals springs, Civil War rendezvous spots, streams, and mineral springs that used the name of "Cohutta Springs." This blog will focus on the maps and physical descriptions of Cohutta Springs. It may be of some help to genealogists and other researchers.